Primed model, ready for base paint application. I use Vallejo Black Surface Primer in a can, also available in tube for airbrush. X number of colors to work with blends. In this example I have 4 colors that range from a deep purple all the way up to white. We’ll be working with well thinned paints. More on this later. A brush with a fine tip, preferably a second such brush to work with the pigments. I personally use Winsor and Newton Series 7 brushes, number 1 and 2. A surface that’s sufficiently large to work on. As you gain experience you’ll be comfortable with smaller surfaces, but start with a large one on the first few tries. Patience. Really. If you try to rush this you’ll either ruin your paint work or have unconvincing blends. Optional: Drying retarder. As the technique is aptly named, this is wet blending, so anything that keeps your paints wet is a bonus. From dark to light: Naggaroth Night, Ultramarine Blue, Ceramite White, with a transition mix of UB + CW at 1:1 mix ratio. You can also use Fenrisian Grey or a similar hue. The theory here is to use the wet paint while on the model to do the work for you: after applying the two colors, clean up the brush in your water pot and wipe excess water from it (or use the spare brush, damp) and start “pulling away” the paint towards the other color. This will break the surface tension on both colors and cause the pigments to move over to both sides. This way you can create mixed colors on the spot and create a seamless blend. Think of it like creating a new palette on the mini itself! 1. First apply the basic shapes, blocks or zig-zags. 2. Start blending the base colors while wet on piece. 3. Repeat as much as needed to get the perfect blend. Let’s see this on an actual piece. The very first thing to do on the part where you want the blend is to basecoat with the darkest color on the range. You can also use the opposite approach and base the lightest color, however it is easier to fix early mistakes with a dark undercoat. Depending on the coverage of your paint, you may need multiple coats to have an even, smooth finish. 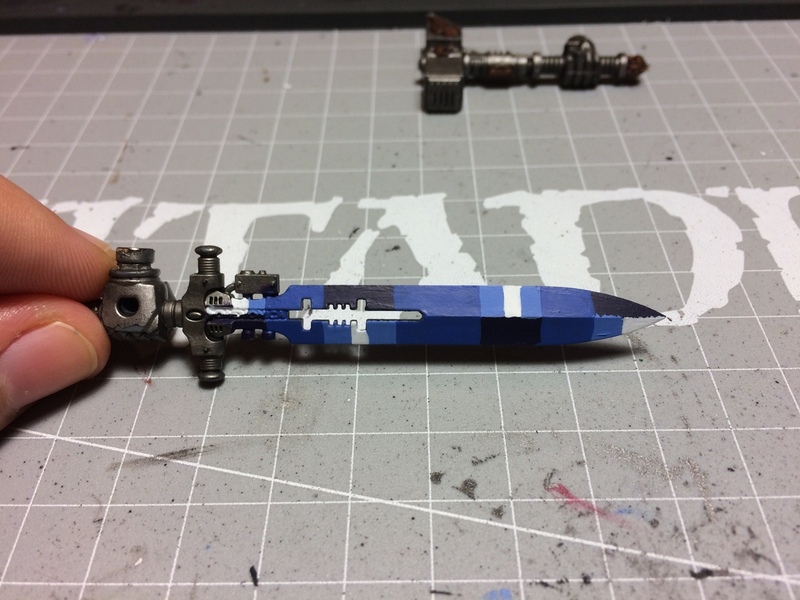 In this example we’re painting force weapons, so having a good finish with no paint strokes is essential. On a black basecoat it took me two coats of Naggaroth Night to get the proper coverage. Left side of blade: Starts from white to dark then again to white and dark at the hilt. Right side has the opposite progression. In order to achieve this we put down the first base colors that will provide the foundation of the colors. You do not have to put in exact block shapes here, you can also have a zig-zag tooth pattern (just don’t make it too obvious). The line or the “teeth” will be covered later with the blends. 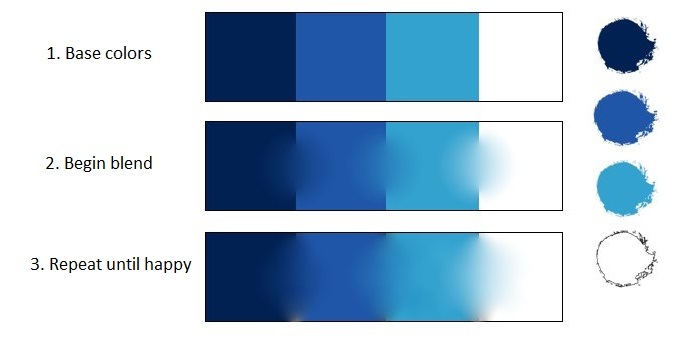 Next, apply the same base colors on the proper spots (blues on blues, whites on whites, you get my meaning) in a thin consistency and leave a little area at the blend point dry. This is where we’ll let the paints converge. The wording on the internet is “milk consistency” but I like to call it “consistency-you-have-ease-working-with”. There is no magic ratio here because it heavily depends on the paint’s ability to cover. For example Khorne Red is a base paint with excellent coverage compared to Mournfang Brown or Naggaroth Night and thus requires more water to thin it down to workable form. You have to act quickly now (if you don’t have a drying retarder) before the acrylics dry out. Pull the desired color away towards the other with a wet brush and you’ll see the colors start to mix. 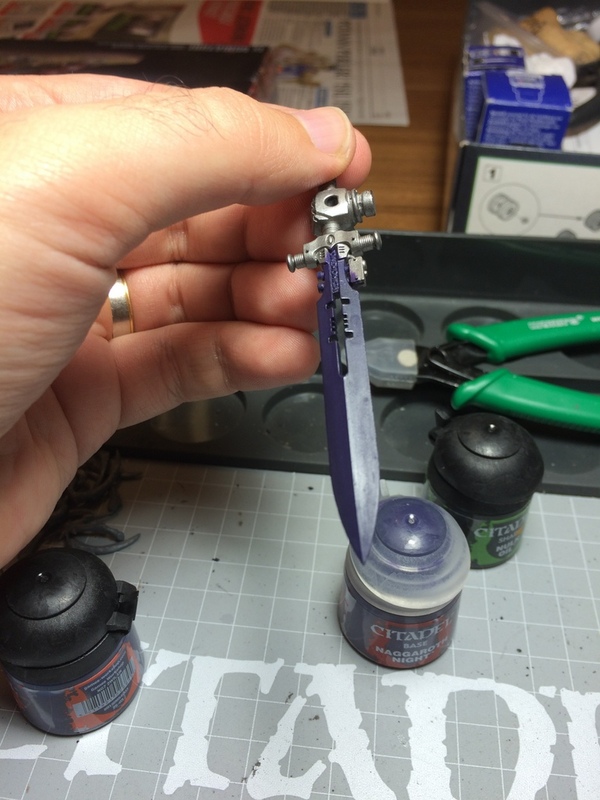 Work with your brush in the pattern you are happy with, for the sword I used the brush along the blade instead of across it to avoid glaring brush marks. As you gain more experience you can create your own patterns like swirls or zigzags, you name it. The paint is drying and will show a darker hue when fully dry. Keep working on the transition with your brush in a back and forth motion until you’re happy with the result. Let dry and see if you’re happy with the result. Since you’re working with thin layers, you can (usually) add however many layers you want. During the blend you can also “refill” the wet paint on the model with the original color to increase strength of one pigment over the other. 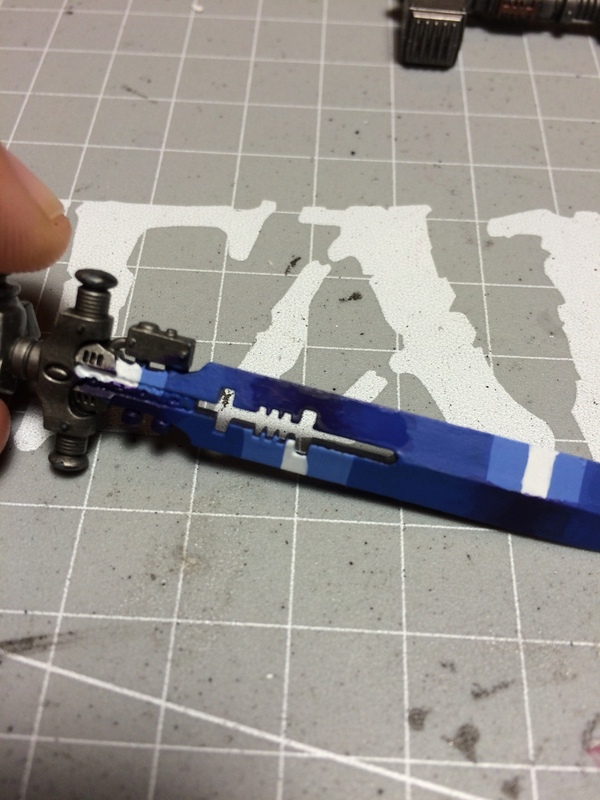 Just add a little wet paint to the opposite ends and pull with your brush to the blend point. 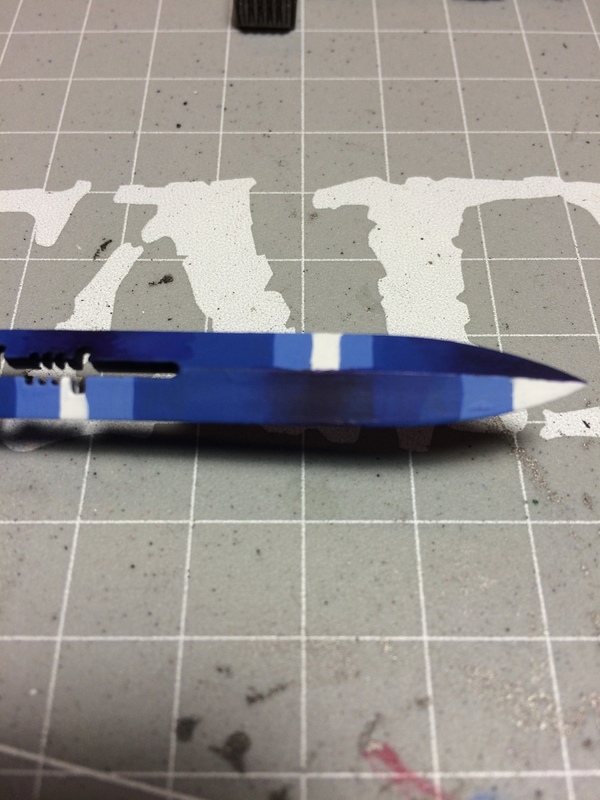 Finished blend from Naggaroth Night to Ultramarine Blue, on bottom and top left/right. Note that blending lighter colors will require more of the lighter color as filler than the darker one that’s “invading” the surface. 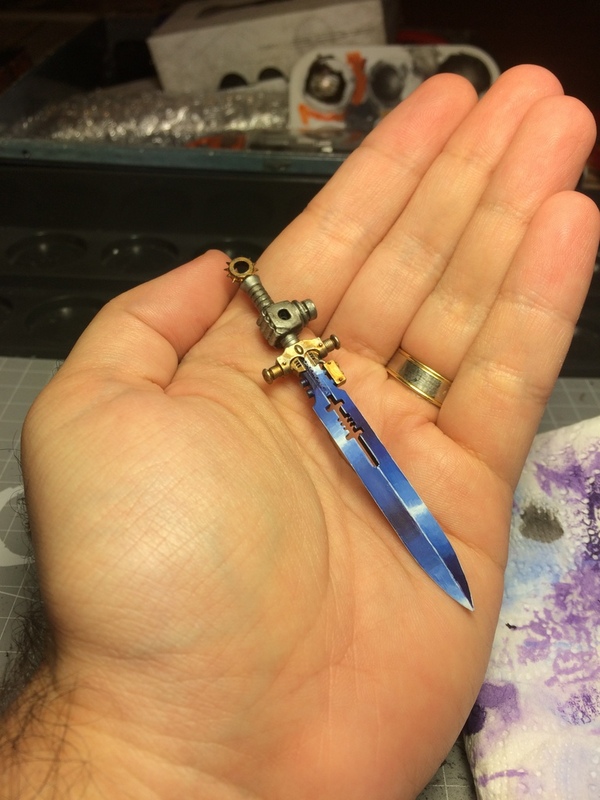 Here’s the finished Greatsword from the Dreadknight kit. Check my WIP posts for more step by steps on this piece! And that’s it. The application is simple but you have to experiment on your own to see the results. Now go out there and paint! If you like, share your results with me and I’ll post them in this corner for future painters! ← Strike from the Sky! Thank you! It’s a difficult technique to explain with texts and pictures, so I’m glad you liked it. I’ll try to update this space if I ever get to make a video of this, which should be a lot better at conveying a message than Paint-created charts! Great tutorial Roemer! An alternative to using drying retarder, would be to try enamels or oils…but that is a very different process, but definitely would extend your working time! I considered using oil paints but from what I read their drying time can take half a day to a full one. Not a good idea! On the other hand enamels require their own thinner and I’m lazy… so it’s a huge problem if I wanna deviate from using acrylics. I can barely stand the preparation for liquid metal and their isopropyl thinners! Glad you liked the tutorial, looking forward to sharing more of my experience. Thanks very much for doing this! I’m still new to all this lark, and have been trying to do something nice for my Necrons but not getting very far. In the end, tried the feathering thing, and that didn’t work consistently well. Think I might try this soon, anyway! You’re welcome, friend. For Necrons when you gain experience I recommend applying NMM for your larger models like the Tomb Stalker (a shame that you had to repair it after the mishap by the way – made me cringe!). I find when applying metallics using the glaze medium (or Lahmian Medium) as thinner for paint helps with the blends a lot more! Really nice and a good detailed read! I have to admit, I was expecting something about glazes, but this is better! Glad that it’s of use then! Excellent tutorial. I think you technique is easy to follow and makes sense. I tried the feathering with some success, but I could see the wet-blending to be more time efficient on large surfaces. I have some 15mm shields to paint and could see this wokring well to get a good transition on the largly flat surface. Glad to see you like the tutorial. I hope the technique will work on your shields and if you like, send me the results and I’ll post them in this corner! My pleasure! Wet blending is a great technique if you lack an airbrush and can produce very convincing color transitions. You can also try glazing and layering which I switched to since the time I posted the tutorial – I’ll post something as soon as I have time for minis again! Hi! I know this is a bit of post necromancy, but I’m learning wet blending and your post came up. I’m curious about the blocking in part – I’m assuming you let those areas dry first? Do you still do it that way, with the blocking in? I see that you’ve gone to feathering/glazing – would you still recommend this block/wet blend approach? Hi Michael, thanks for the comment. 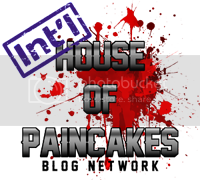 While the blog is inactive I’m still around. If you will follow the method then yes, you first let the blocked areas dry before applying a fresh layer of the paint to be blended. Otherwise you can try wet on wet blending directly with the colors using a drying retarder but that would be a bit difficult with the lighter colors if you’ve used a dark primer like I did. 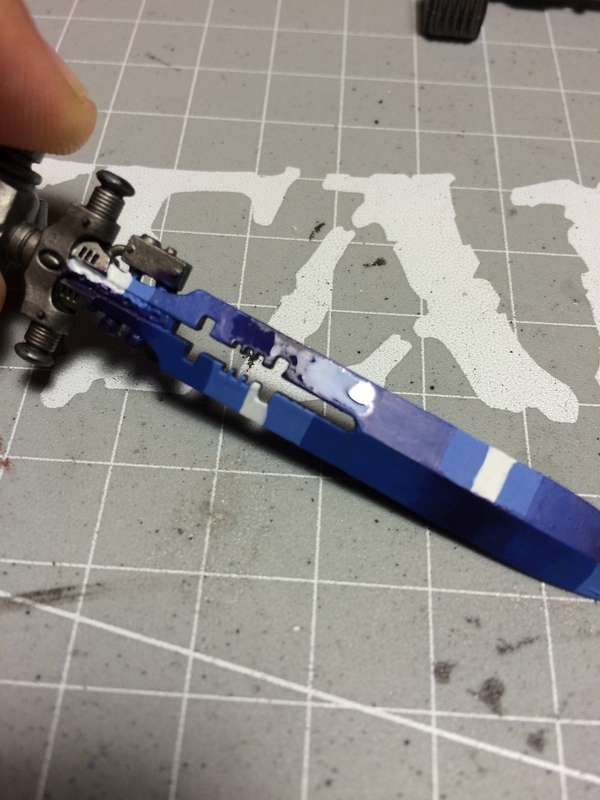 My current method when I do pain is glazing, where I gradually build up to the lightest color however that takes layer upon layer for something like a power or force weapon like the example. I hope this helps and happy painting!